Photo. High aspect-ratio design helps this seabird wing it. An arctic tern soars over Iceland. These small birds have one of the longest annual migrations of any animal on Earth. Every year, arctic terns migrate from the Arctic Circle to the Antarctic Circle—a round-trip journey of about 30,000 kilometers (18,641 miles). 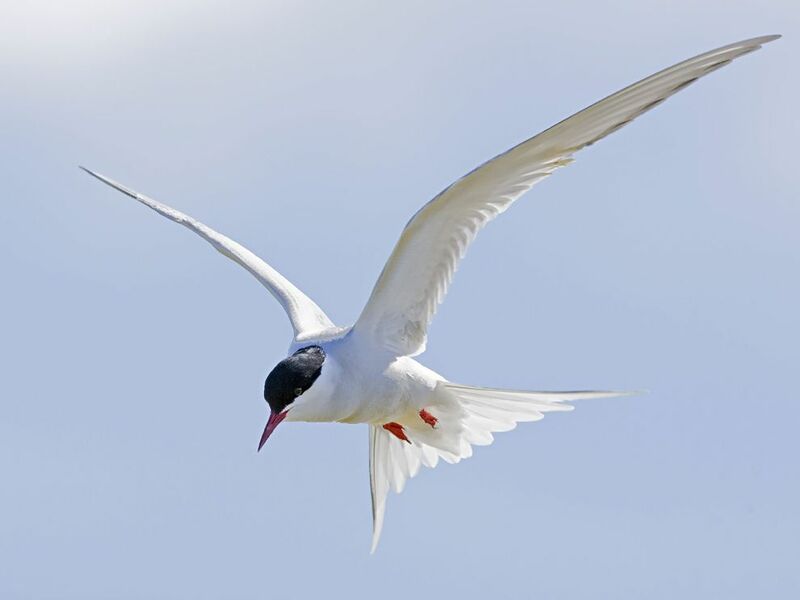 Arctic terns have one of the longest migrations of any animal on—or above—the Earth. These small, inconspicuous seabirds fly from the Arctic to the Antarctic every year . . . and then they fly back. The arctic tern's wings are ideally adapted for such long flights. High aspect-ratio wings are long and narrow, ideal for slow, usually low-altitude flight. Birds with high aspect-ratio wings often glide and soar over long distances. Arctic terns are seabirds that feed primarily on fish. How do high aspect-ratio wings complement this feeding pattern? High aspect-ratio wings allow arctic terns to glide low over the ocean, using their beaks or feet to grab fish swimming near the surface. High aspect-ratio wings are common to many birds with long migration patterns. Why is this wing type beneficial to these birds? High aspect-ratio wings allow birds to glide and soar. Birds such as the arctic tern can travel long distances without using valuable energy to flap their wings to fly. What types of aircraft do you think use high aspect-ratio wings? Answers will vary! The wings of spyplanes usually have very high aspect ratios. Spyplanes often need to fly very long distances with minimal fuel. Both manned spyplanes (such as the U-2) and unmanned "drone" spyplanes (such as the Predator) have very high aspect-ratio wings. in aeronautics, the ratio of the square of an object's wingspan to its total wing area (planform). the distance between the tips of a bird's wings when stretched out.